In an earlier post (see June 2010) I announced a forthcoming series of posts on Scratch, the programming language especially designed for (but not limited to) kids. Scratch asks its users to imagine, program, and share. As an example of this three-step sequence, I’ll describe a project of mine that I imagined, programmed, and shared (uploaded) to the Scratch homepage. 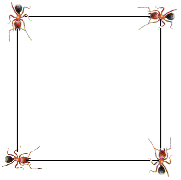 Imagine four motionless ants sitting at the corners of a square, all facing in the counterclockwise direction. At a given signal, each ant moves towards the ant ahead of it. What will the paths of the ants look like? Decades ago, I saw this questioned posed in a book. This was long before we had programming languages like Scratch to provide a wordless, dynamic, answer. The script (program) that answers the question is not an entry-level program but Scratch contains two commands that greatly simplifies the programming; point towards and move 5 steps. Since the ants are numbered, it's easy to point each ant towards the ant in front. To view what happens when the ants are turned loose, click on the following short, one-minute video. What’s not visible in the video are the scripts that create the ant’s motion. As can be seen in the video, the ants trace a spiral path and the straight lines connecting the ants always form a square. I uploaded the working Scratch file to the Scratch web site for any user to look at and any registered user to download. If interested, Scratchers can modify the program to make it do what they would like it to do. For example, what if three ants are at the corners of a triangle? To view my Scratch projects, go to www.scratch.mit.edu and search on grandadscience. The Scratch homepage contains data as to the age and numbers of registered Scratch users. Tens of thousands, at each of the ages 11 through 16, form the bulk of Scratch users. Few are getting instruction in public schools. It would appear that kids are learning how to program in Scratch from each other! Also, girls are as well represented as boys. I'm not suggesting that all kids need to learn to program in Scratch. I am saying that all kids should know about Scratch and make the decision for themselves. The math and science (particularly the math) they learn in school then has an outlet. To help you and your kids or grand kids get started with Scratch, I've made several short videos. Instead of loading this post with the videos, below are the links to the seven How to Scratch videos I uploaded to Youtube. Every video is short (two minutes or less), builds on the previous video, and asks the viewer to duplicate (with their downloaded version of Scratch) what's just been viewed. The first video shows how easy it is to download the Windows or Mac version of Scratch. Be sure to bookmark the homepage. By the seventh video (15 instructional minutes later), the user has written a script that draws a square with any side length. I will be here to answer questions about Scratch and I will occasionally post a Scratch update or project.